A group of entrepreneurs and designers in basement renovation coming together to renovate the basement of your house into a: family room, home theater, wine cellar and even into a Bachelor’s apartment. We are general and specialized RBQ licensed contractors and professional interior designers offering a guarantee of renewal and each having a specialty: several general contractors for big works, cabinetmaker, interior designer and even a structural engineer to design and approve structural plans. 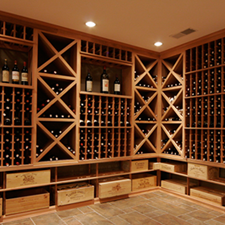 Design of a wine cellar in the basement: cellar furniture, temperature control, designer and renovation contractor. 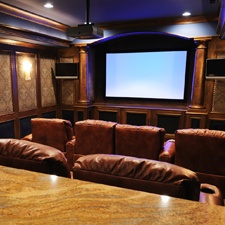 Plan, design and construction of a home theater with a large screen and electronic equipment in your basement. Family room and children's room in the basement to be with family or friends by a designer and renovator. 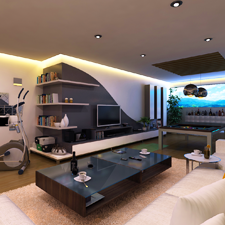 Modern Bachelor’s as rental housing in the basement with separate entrance to generate income. Design and renovation. Whether it is for a partial basement renovation by adding only a wall to create a room, remove a carrier wall to replace it by a beam and create more space or renovate it into a family room, a laundry room, a bathroom and storage space, or build a home theater, a wine cellar or transform it into a Bachelor’s of 2 ½ or 3 ½ rooms to generate rental income with a separate outside entrance, then we can help you. We do everything from A to Z. First we meet with you to take your ideas, your budget and we offer a range of clear and detailed services which may include: drawings & plans, specifications, interior design and renovation. Then a work schedule is established and we do the turnkey work taking care of everything. You will see your basement gradually transform into a dream space. Our group of basement renovation Montreal contractors covers a wide area around the region of Montreal: Laval, Blainville, Terrebonne, Mirabel, Saint-Jérôme, Kirkland and the West Island, Vaudreuil, La Prairie, Saint-Hubert Longueuil, Brossard, Boucherville, Beloeil, Repentigny, Châteauguay, Mercier. 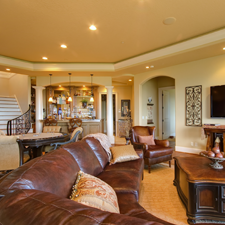 We are the experts in basement renovation.